The aircraft was handed over on January 10 and is due to be delivered to McConnell Air Force Base in Kansas before the end of the month. The first aircraft are reportedly being accepted with a number of Category-1 deficiencies, considered the most serious of technical issues, as the USAF considers the training requirement urgent and other capabilities of the KC-46A are considered superior to those of the aircraft they will replace. DefenseNews reports that, under an agreement to accept the aircraft with the deficiencies, the USAF can withhold up to US$28m (A$38.8m) per aircraft until a fix for them has been implemented. “Despite all the flaws, there is operational utility of the system,” a USAF spokesman told DefenseNews. Writing for Forbes.com, defence analyst Loren Thompson described the deficiencies as “not show-stoppers”. “The reality is that if the KC-46A had serious deficiencies, the Air Force wouldn’t be accepting it. There are two issues that need to be addressed,” Thompson wrote. “First, a remote vision system in the cockpit slightly distorts the view of planes receiving fuel when the sun creates glare or shadows – a difficulty that can be rectified by shifting the direction of the planes to alter how light hits them. Second, the Air Force did not provide an adequate refuelling specification for the ‘boom’ that delivers fuel to receiving planes, and as a result one type of aircraft that the service has been trying to retire for years [the A-10 Warthog] has difficulty receiving fuel. 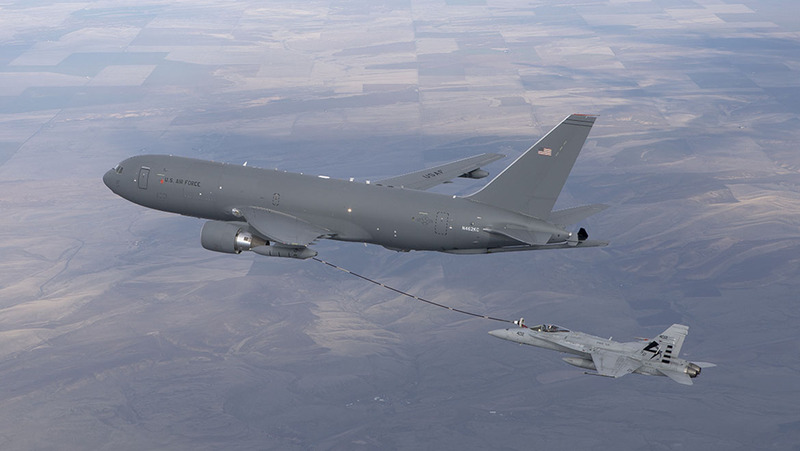 The KC-46A is developed from the commercial Boeing 767-200 airframe, and features a centreline boom and two wingtip hose and drogue pods, plus military specific communications and self-defence systems. 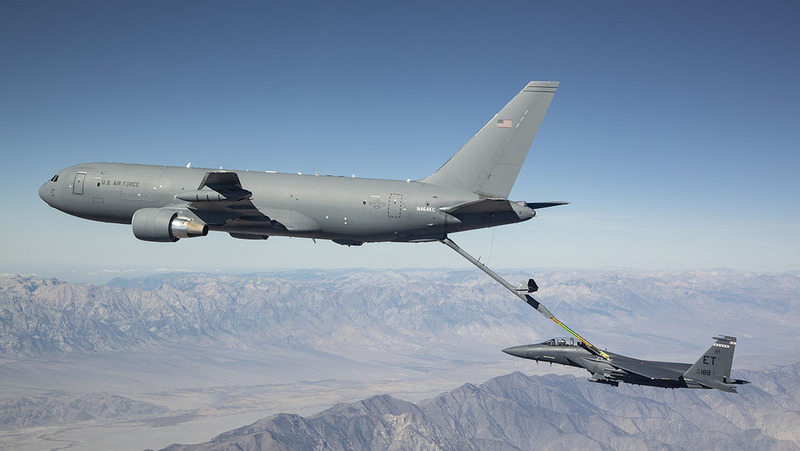 It is the first USAF tanker to have the boom operator located in the aircraft’s flightdeck where the boom is controlled via a remote vision system (RVS). Previous generations of tankers had the boom operator conduct boom refuellings using visual cues directly through a large window in the rear fuselage. Six KC-46 aircraft have completed more than 3,800 flight hours and offloaded more than four million pounds (1,800 tonnes) of fuel to A-10, B-52, C-17, KC-10, KC-135, KC-46, F-15E, F-16 and F/A-18 aircraft, Boeing says. “The KC-46A is a proven, safe, multi-mission aircraft that will transform aerial refuelling and mobility operations for decades to come. We look forward to working with the Air Force, and the Navy, during their initial operational test and evaluation of the KC-46, as we further demonstrate the operational capabilities of this next-generation aircraft across refuelling, mobility and combat weapons systems missions,” said Leanne Caret, president and CEO of Boeing Defense, Space & Security, in a statement.
.@USAirForce accepts Boeing's first #KC46 Pegasus next-gen tanker. Next stop for the world’s newest tanker: @22ARW #TeamMcConnell. The KC-46A was selected in 2011 for the USAF’s KC-X requirement for 179 tankers to replace KC-135E in service. Under a fixed price contract, Boeing was to have delivered the first 18 KC-46As in August 2017, but development problems with the aircraft’s boom, RVS and other systems have led to several delays and more than US$3bn (A$4.1bn) in costs for the manufacturer. The USAF currently has 52 of the planned 179 aircraft on contract, and these are expected to be delivered at a rate of about 18 aircraft per year. A follow-on KC-Y requirement is currently being developed, for which Airbus and Lockheed Martin recently agreed to jointly position and develop the Airbus A330 MRTT.